Community Broadband Bits – Community Broadband Bits is a short weekly audio show featuring interviews with people building community networks or otherwise involved with Internet policy. This week, we have another interview that Christopher recorded while he was at the 2019 Broadband Communities Summit in Austin, Texas. Dr. Robert Wack from Westminster, Maryland, where the town is partnering with Ting Internet, sat down for a conversation on telemedicine. As the United States’ healthcare system continues to degrade, hospitals, doctors, and other caregivers are looking for new and efficient ways to provide better care for their patients. Broadband is a tool that healthcare professionals are already using for preventative care, consultation, and treatment from a distance. Dr. Wack and Christopher discuss some of the innovations within the healthcare industry that use connectivity, data, and human engagement. These approaches reduce costs and help patients by reducing the stress that accompanies unnecessary trips to the emergency room or can identify when a patient requires medical intervention from the security of their home. Christopher and Dr. Wack also discuss some of the new challenges that accompany these innovations and strategies for bringing these programs to large groups of people, rather than focusing on small populations. Dr. Wack updates us on the progress of the network deployment in Westminster and discusses the community’s Mid-Atlantic Gigabit Innovation Collaboratory (MAGIC), the nonprofit established to optimize use of the fiber network they began developing in 2014. Read more of our coverage about Westminster and their public-private partnership with Ting. This show is 36 minutes long and can be played on this page or via iTunes or the tool of your choice using this feed. You can listen to the interview on this page or visit the Community Broadband Bits page. We want to thank Asfi for using his birthday to start a Facebook fundraising campaign for ILSR~ Thanks, Asfi! Interest in community broadband and broadband service from cooperatives has grown significantly within the past few years. This legislative session, lawmakers in states such as Vermont, North Carolina, and Arkansas, have decided that they’d like to start contributing to new ways to bring better Internet access to their constituents. This week, Christopher and Jess Del Fiacco, our Communications Specialist, sit down to review some of the most recent state bills that we find promising. Jess and Christopher talk about H 513 making it’s way through Vermont’s legislature. The bill contains policy changes and financial support designed to invigorate local broadband projects. H 513 was developed after state leaders examined the success of ECFiber, the regional network that brings gigabit connectivity to more than 20 communities in the central part of the state. The state of North Carolina’s FIBER NC ACT, which relaxes some of the state’s restrictions on local Internet network infrastructure investment, also comes up in the conversation. Christopher finds the bill a promising start to restoration of local telecommunications authority in North Carolina. State lawmakers are also considering another bill that will assist with pole issues. Christopher and Jess spend some time examining what’s happening in Tallahassee, Florida, where city leaders have decided that they will not pursue a feasibility study for the time being. Christopher addresses the meaning of “competition” in Internet access providers. It shouldn’t be a question that’s up for debate, but here we are. This show is 32 minutes long and can be played on this page or via iTunes or the tool of your choice using this feed. 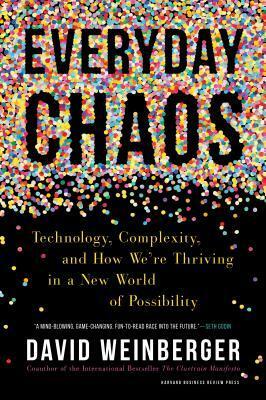 And order his most recent book from IndieBound, Everyday Chaos, to be released in May 2019. This show is 41 minutes long and can be played on this page or via iTunes or the tool of your choice using this feed. On a typical episode of the Community Broadband Bits podcast, you’ll hear from a guest whose community may be in the process of deploying a publicly owned fiber network, or an elected official who has championed a broadband-friendly policy for their city or town. Sometimes we talk to local business leaders or cooperative board members who’ve led their communities toward better connectivity. For the first time ever, we have a comedian on the show this week — Ron Placone. What does this mean? Not that the issue of publicly owned networks is joke material, but that it’s something that people from all walks of life care about. Ron is host of the streaming show, “Get Your News on With Ron,” a show driven by its audience. He has a popular YouTube channel and is regularly on the Jimmy Door Show and The Young Turks, often discussing municipal networks and the importance of network neutrality. In his home town of Pasadena, Ron is also a broadband champion, inspiring fellow citizens to attend City Council meetings and encourage elected officials to consider the possibility of a publicly owned broadband network.Christopher and Ron discuss how Ron’s using his ability to reach people to help spread the word about the benefits of municipal network and some of the challenges he’s faced as a citizen advocate. They discuss the relationship between municipal networks and network neutrality. As an artist and journalist, Ron is a steadfast believer in the tenets of network neutrality and like many people, see that local broadband networks can provide it. For more of Ron’s videos, from comedy to news to more conversations on municipal broadband, check out his YouTube channel. You can also go to ronplacone.com for more information. Brent Christensen, Chief Operating Officer of Christensen Communications, came into our Minneapolis office to sit down and have a chat with Christopher this week for podcast 346. Their interview comes a short time after Christopher and several other Institute for Local Self-Reliance staff took a tour of the Christensen Communications facilities. Brent has an additional role as President and CEO of the Minnesota Telecom Alliance (MTA) a group that advances policies encouraging expansion of broadband connectivity. Brent describes some of the ways MTA has helped Minnesota and local leaders establish policies to help private sector telecom companies bring better connectivity to local communities, especially in rural areas. He and Christopher spend time discussing Minnesota’s Border to Border Broadband Program and why they think it’s been a success. The conversation also covers the permitting process, railroads, and partnerships, in addition to other topics. Brent and Christopher discuss some suggestions for communities that are interested in working with local companies, based on Brent’s years in the industry and the knowledge he’s gained from his family’s business. This show is 36 minutes long and can be played on this page or via iTunes or the tool of your choice using this feed. This week, Marshall FiberNet’s Customer Service and Marketing Manager Jessica Slusarski talks to Christopher about the town’s investment in their community broadband network. Quiet and quaint Marshall, Michigan, didn’t expect to become one of the state’s communities with the best Internet access, but here we are. Like many other small towns where big incumbent providers didn’t want to make infrastructure investments, most of Marshall was stuck with DSL and some premises were still using dial-up connections. Their solution was clear — build a Fiber-to-the-Home (FTTH) network. Jessica and Chris discuss how the idea became a reality and what were some of the services that the city decided they wanted to include for subscribers, based on the needs of residents and businesses. They also discuss how, even though Michigan requires local communities to reach out to the private sector first, a lack of responses allowed the town to move forward. Jessica describes the favorable response from users and how subscribers are taking advantage of better Internet access than they’ve ever experienced. We also learn about nuts and bolts, including what it took to get the network deployed, how the city administrates the utility, and what’s next. You can learn more details by reading our coverage of Marshall’s FiberNet. The transcript for this podcast is available here. Missouri is one of the states where electric cooperatives are taking the lead in bringing high-quality Internet access to rural areas. This week, we talk with Jack Davis, Vice President of IT and Special Projects at Pemiscot-Dunklin Electric Cooperative. The co-op is in the midst of deploying Fiber-to-the-Home (FTTH) to members in their service area, located in Missouri’s “Bootheel” region. The mostly agricultural area consists of three counties that extend down from the southeast corner of Missouri and is surrounded by Arkansas, Tennessee, and Kentucky. The co-op brought electric service to homes in the region in the 1930s and Jack and his colleagues are performing a similar service today by bringing broadband to a region where large corporate ISPs haven’t invested much in infrastructure. In this interview, he describes what Internet access is like for people in the region before the cooperative decided on the project, and how strong support from residents and businesses has helped the cooperative determine the services to offer. Jack and Christopher also discuss how the geography and environment influenced engineering and design plans, how locals are responding to the new service, and potential plans for growth in the region. In this conversation, you’ll also hear about some of the partnerships that Pemiscot-Dunklin has forged with other cooperatives in order to offer better services to cooperative members. Order Susan’s book online at Indiebound.org.